Command Sergeant Major Franklin Douglas "Doug" Miller (27 January 1945 - 30 June 2000) was a U.S. Army soldier and a recipient of the U.S. military's highest award for valor, the Medal of Honor, for his actions in the Vietnam War. Franklin Douglas Miller was born on 27 January 1945 in Elizabeth City, NC. He joined the Army from Albuquerque, NM in 1966. On 5 January 1970, Miller was serving as a Staff Sergeant in the 5th Special Forces Group, 1st Special Forces. On that day, in Kontum Province, Republic of Vietnam, Miller's small group came under attack from a numerically superior enemy force. He single-handedly held off an enemy assault, arranged for a helicopter extraction of his unit, and again fought off the enemy alone until relief arrived. For his actions during the battle, in which he was seriously wounded, he was awarded the Medal of Honor. Citation: For conspicuous gallantry and intrepidity in action at the risk of his life above and beyond the call of duty. S/Sgt. Miller, 5th Special Forces Group, distinguished himself while serving as team leader of an American-Vietnamese long-range reconnaissance patrol operating deep within enemy controlled territory. Leaving the helicopter insertion point, the patrol moved forward on its mission. Suddenly, 1 of the team members tripped a hostile booby trap which wounded 4 soldiers. S/Sgt. Miller, knowing that the explosion would alert the enemy, quickly administered first aid to the wounded and directed the team into positions across a small stream bed at the base of a steep hill. Within a few minutes, S/Sgt. Miller saw the lead element of what he estimated to be a platoon-size enemy force moving toward his location. Concerned for the safety of his men, he directed the small team to move up the hill to a more secure position. He remained alone, separated from the patrol, to meet the attack. S/Sgt. Miller single-handedly repulsed 2 determined attacks by the numerically superior enemy force and caused them to withdraw in disorder. He rejoined his team, established contact with a forward air controller and arranged the evacuation of his patrol. However, the only suitable extraction location in the heavy jungle was a bomb crater some 150 meters from the team location. S/Sgt. Miller reconnoitered the route to the crater and led his men through the enemy controlled jungle to the extraction site. As the evacuation helicopter hovered over the crater to pick up the patrol, the enemy launched a savage automatic weapon and rocket-propelled grenade attack against the beleaguered team, driving off the rescue helicopter. S/Sgt. Miller led the team in a valiant defense which drove back the enemy in its attempt to overrun the small patrol. Although seriously wounded and with every man in his patrol a casualty, S/Sgt. Miller moved forward to again single-handedly meet the hostile attackers. From his forward exposed position, S/Sgt. Miller gallantly repelled 2 attacks by the enemy before a friendly relief force reached the patrol location. S/Sgt. Miller's gallantry, intrepidity in action, and selfless devotion to the welfare of his comrades are in keeping with the highest traditions of the military service and reflect great credit on him, his unit, and the U.S. Army. 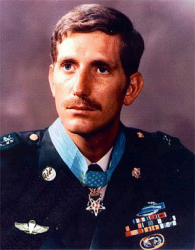 Miller retold the story of his actions on the day he earned the Medal of Honor, along with other experiences from his career in the Special Forces, in his memoir, Reflections of a Warrior: Six Years as a Green Beret in Vietnam. Range 37, part of Fort Bragg in NC, was rededicated in Miller's honor in 2002. The Franklin D. Miller Trust was established to provide material support for his two children. Command Sergeant Major Franklin Douglas "Doug" Miller died on 30 June 2000, at age 55. He was cremated and his ashes were scattered in New Mexico.